If you want to know why the Mazda CX-5 is such a popular vehicle, take a look at the safety features packing into this one crossover SUV. The all-new Mazda CX-5 makes use of the Blind Spot Information System for identifying if another car happens to roll into a blind spot behind your vehicle. If anything is in a blind spot, the system begins flashing your side mirrors so you are aware and don't move into that lane and get into an accident. 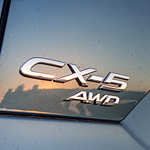 The Cross-Traffic Alert in the CX-5 works similar to blind spot sensors, scanning behind your vehicle for any cars coming from either direction as you ride in reverse. If anything is going to be in your path, the alerts flash so you can safely stop in time. You can drive the Mazda CX-5 off the lot today for a thrilling test drive when you visit Piazza Mazda of Reading today!